Football used to mean tailgating to me. When we lived in Denver, we went to a lot of Broncos games- not necessarily because we liked the Broncos, but rather because we loved to tailgate! Okay, there was a time when I liked and cheered for the Broncos - but I found the fans and the media insufferable. When they lost it was never there fault; the ref was against us, it was cold, the wind was blowing against us....blah, blah, blah. But, tailgating! There is just something about hanging out in a parking lot with thousands of fans, the smell of barbecue lofting about, the anticipation of the game and throwing the football around with strangers. So now football means good old crock pot time- hey, it's cold in Chicago. You gotta stay in and make something warm and hearty. 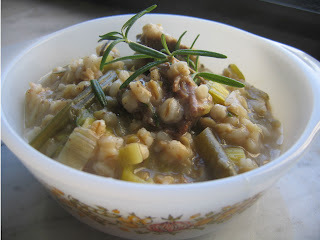 To kick off the season I created this simple leek and barley stew. I still had rosemary growing on the deck, so that came into play, and I found a small package of stew meat in the freezer. (You could leave out the meat and have a vegetarian stew!). 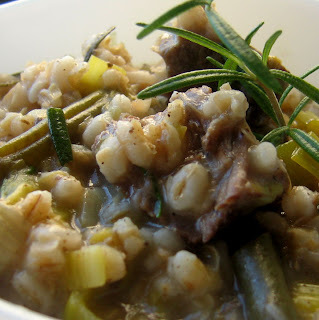 The leek, barley and rosemary are a real nice mixture - a tasty departure from a typical dark, meaty stew. And its a crockpot recipe - just add it all in and let it cook! You could even take this with you to the tailgate party, it's keeps you warm and filled for hours....hmmm, sounds like fat and happy to me!! Add all the ingredients to the crockpot on a medium high heat. Let cook for at least 4 hours. The longer it can cook, the more tender the meat will be. Check for taste, you may need to add more salt or pepper. If you know you're going to be gone for more than say 7 hours, lower the heat to medium low. And get to know your crockpot - some cook hotter. Mine is old so it's getting a little 'tired'.